Diese Just Color Picker Farb-Picker kann Farbwerte in 6 verschiedenen Formaten ablegen: HTML, RGB, HEX, HSB/HSV, HSL, HWB, CMY und CMYK, gibt es auch noch eine 3-, 9- und 15-fache Vergrößerung des Ausschnitts zur Farbwahl, welche mit der Tastenkombination ALT+X (Voreinstellung, kann geändert werden) abgelegt wird. Der Farb-Picker protokolliert die gewählten Werte, RGB- und RYB-Farbkreise zeigen Komplementär-Farben. Außerdem gibt es Farbfinder, Gradient und RGB/HSV/HSL-Farbmixer. Portabel: diese Anwendung kann z.B. auf USB-Sticks verwendet werden. Änderungen: Added CMY format, improved input check for code-to-colour conversion, upgraded macOS file from 32 to 64 bit. 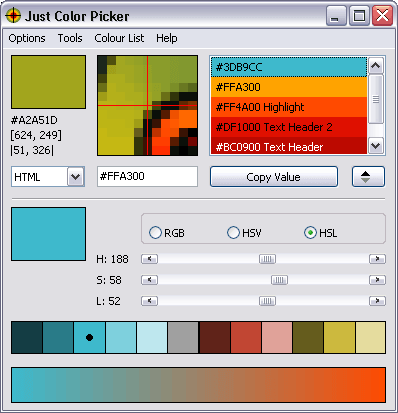 Just Color Picker has no limits on its usage and distribution as long as the program file is not modified in any way (including its incorporation into any downloaders or installers, or addition of advertisement). You may give this software to friends, burn it onto CDs, DVDs or other media, include it onto cover CDs, publish notes in magazines, write articles on other website, share the information about it via social media, or upload it to software archives without asking the author's permission provided the Just Color Picker program file remains exactly as it was published on annystudio.com website and is not used in any malicious activities. Any links to the annystudio.com website are appreciated. This product is distributed AS IS. No warranty of any kind is expressed or implied. You use this software at your own risk. Neither the author nor agents of the author will be liable for data loss, damages, loss of profits or any other kind of loss incurred directly or indirectly while using or misusing this software.